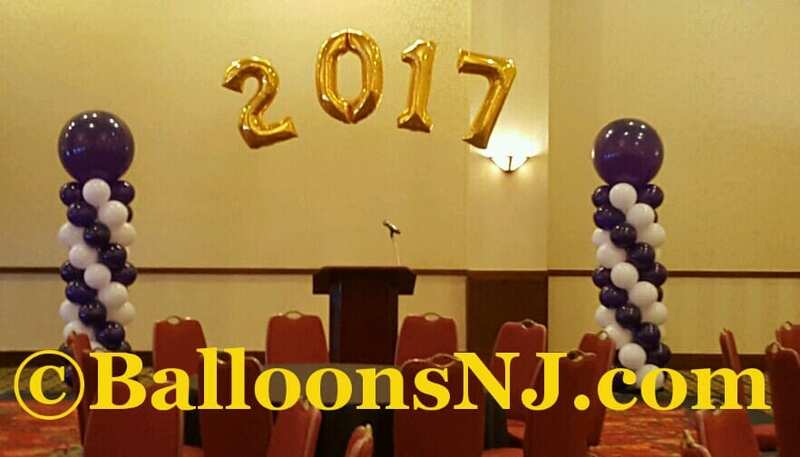 Welcome to Balloons NJ. From the Ben Franklin bridge to the GWB, we got NJ and surrounding areas covered. We decorate your event as if it were our event. Recently had an opportunity to help turn a nice family room into a malt shop look for a fifties party. Qualatex colors are mostly Rose (pink), White, Black and Tropical Teal with an undersized red balloon as the cherry on top. Some silver and clear balloons complete the look. I used 2 Clik-Magnets and mono-filament line to connect the two wrought iron chandeliers with 5 12-balloon clusters. The client did lot of work around the home making each room’s look uniquely 1950s. The furniture here was largely moved out of the way and the client found a nice black and white checkerboard floor covering. At teh bottom of the photo you see the backs of a few daisy-clusters on the stair railing. Here are balloon decorations that work outdoors. For open spaces like a large lawn or courtyard, the cluster streamer works real well and can match any color scheme. This example is tropical colors (in the perfect morning light) before they got placed at their intended locations. Inside tents and gazebos these air-filled clusters can often be rigged up. Even single balloons in various sizes can be stung on rigged lines.. The air-filled tent decor seen above can be installed the prior day in most cases. If the tent is so large that it is hard to rig lines for air-filled clusters you can go to helium-filled cluster lines created on the day of the event. The ends of the cluster line arch have to be attached to *something*.. in the first case, border fences.. other examples have been trees, tent poles, light poles, fixtures on a building… while it can work on weights you always have to be aware of where people might be walking. The daisy on rails look is very nice. Also works on tent poles, light poles and even trees. And if you make them a solid color without a contrasting middle, that works also. Some public parks allow balloons. NJ State parks do not. But often you will find picnic areas and groves with structures like these. This gazebo made it easy to run lines with air clusters inside the gazebo. Without the cross beams on the ends, I would likely need to use helium clusters inside. 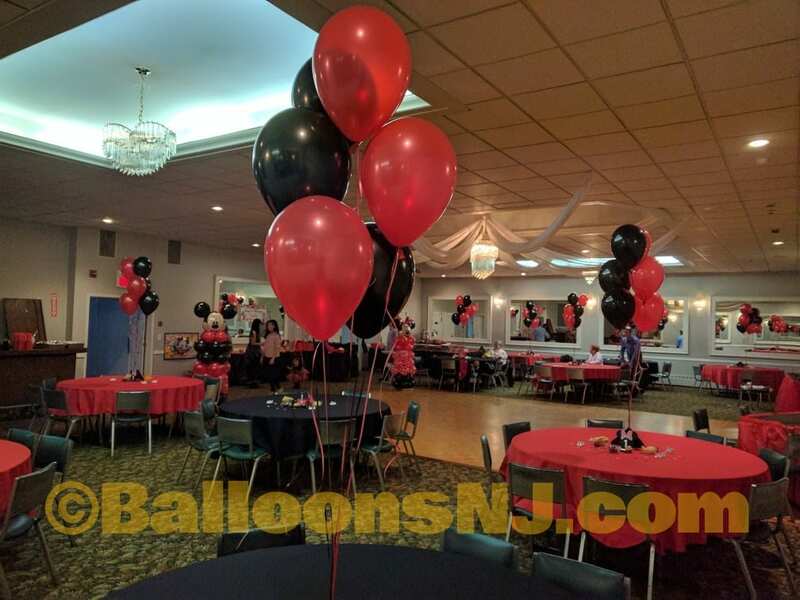 On the outside a line can be run and drape single air-filled balloons. Really tall columns make a statement as well.. though positioning them next to tent poles or similar structures for added support might be necessary. If you need something directly on a table you want something the wind won’t get a hold of.. This table piece has 8 5-inch balloons on a shiny spray weight. I’d probably use red and blue weights similar to this one and use your colors. Somewhat flexible to color schemes using different color weights and balloons. Of course the big helium arches work.. Enjoy your backyard or pool party or outdoor event and make it an instantly recognizable celebration with balloons! Cafe Azzuro was quite nice with a friendly staff and is BYO. 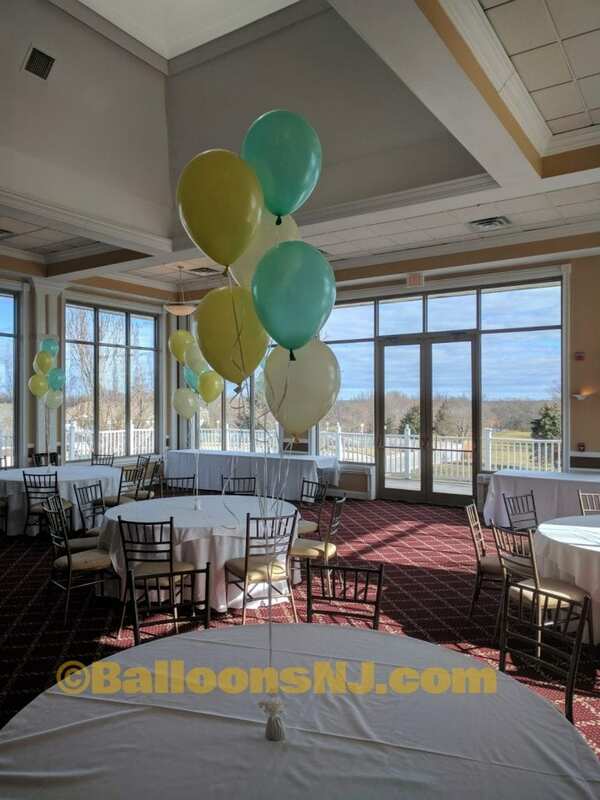 Did gold and pearl white 80 column as a focal point / photo backdrop and table centerpieces and balloon trees added both “80” and Happy Birthday balloons. Gold and pearl white with stars-around clear beneath the foil theme balloons. Packed arch in pink, rose, lilac and yellow with print colors Daisy balloon clusters tie to a fence. Windy day made the arch a bit less than perfect. 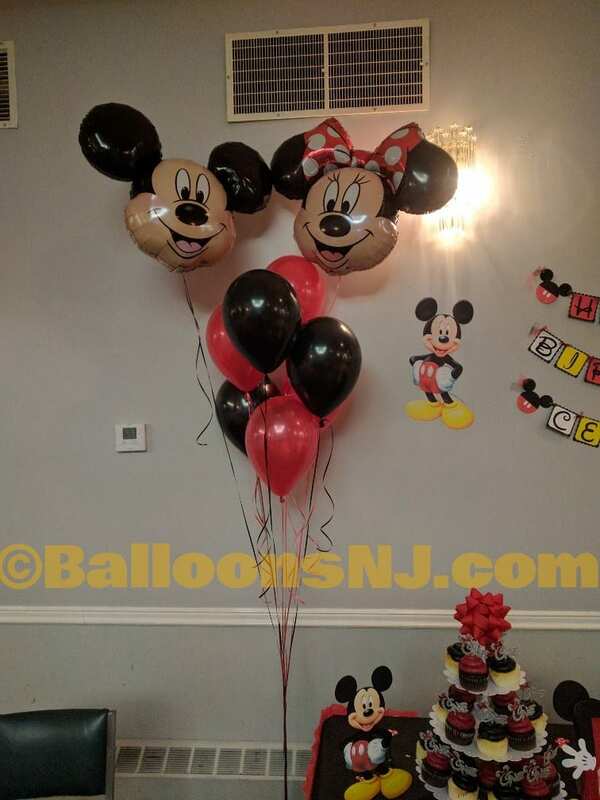 Jungle animal theme balloon decor at the popular Akbar Restaurant in Edison, New Jersey. Animal print balloons used along with mocha brown, goldenrod yellow, lime and orange balloons. 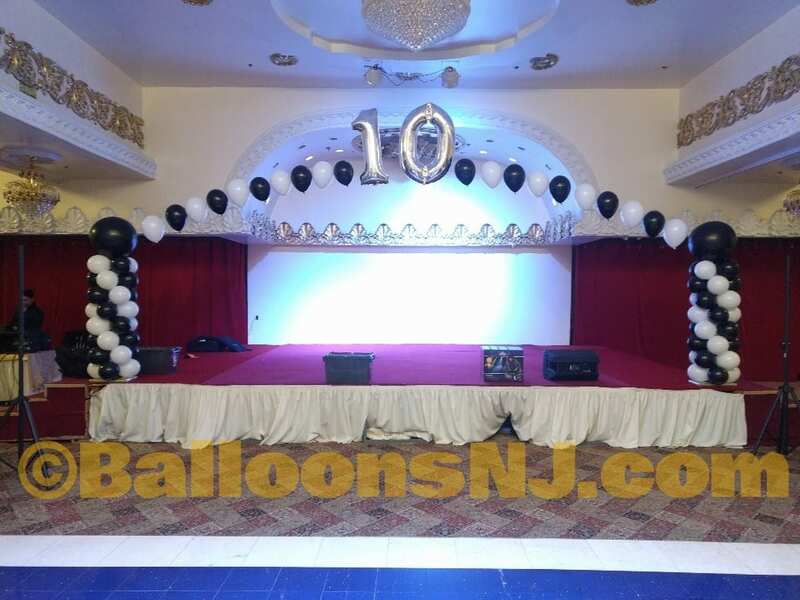 At Royal Albert Palace in Edison, NJ, this black and white stage arch for a fundraising event for an educational charity. 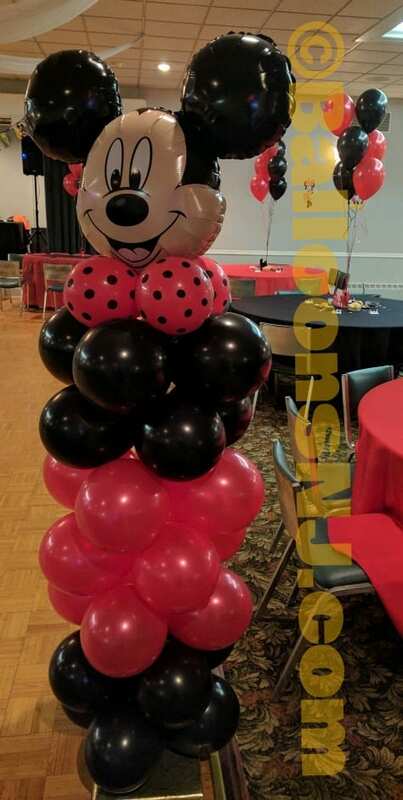 Featuring the classic red and black and polka dots for Minnie and Mickey, this client opted for metallic red and black all-latex for the tables. Came out very nice. 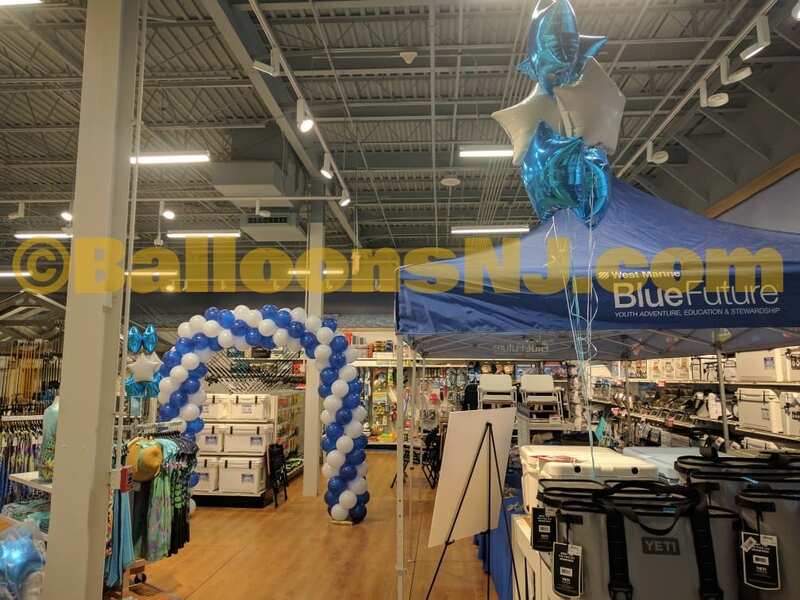 A nice big West Marine store opened in Woodbridge, NJ today and we got to create a nice double-door-sized packed arch in their royal blue and white colors. They also got a large number of foil star balloons that might last them the whole week. BTW.. the packed arch could last several weeks indoors. 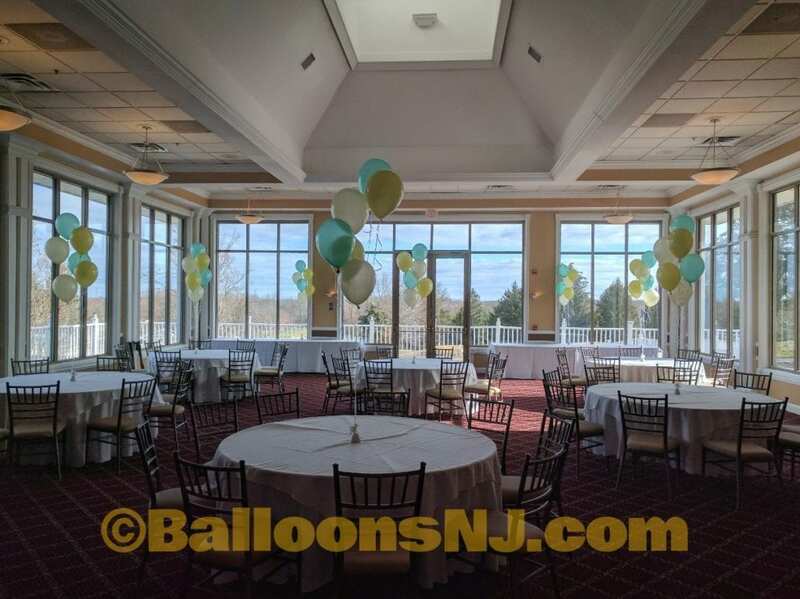 6-balloon centerpieces for 8 tables for a morning bridal shower. The requested colors were muted sage green, butter yellow and cream. In Qualatex balloon colors, this translated to pearl mint green, pearl lemon chiffon and pearl ivory. Knob Hill Golf Club has a very nice room for such events.